Valentine’s Day cards don’t get any cuter than this! This little puppy looks so happy snuggling with his stuffed animal. They are tucked in with a special blanket that is covered in little hearts. So special! Any girl would really love this Valentine’s Day card, she might even show her friends! Be sure to get this sweet greeting card out today! If you are looking for the sweetest Valentine’s Day card ever, you just found it! 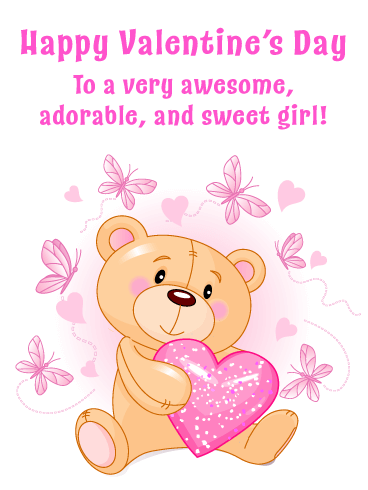 Any little girl would love to receive this very special greeting card that showcases an adorable bear holding a pink sparkling heart. Pink butterflies and hearts surround the bear and make this card even more special! 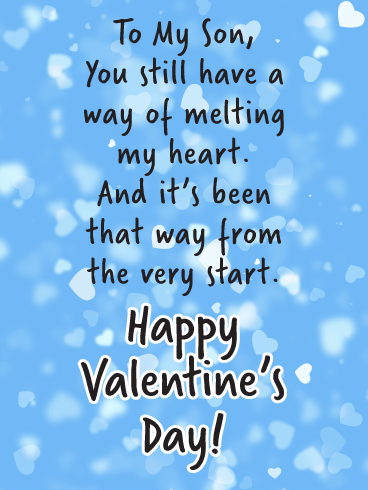 Send this wonderful card over to a child that you want to make happy on Valentine’s Day. 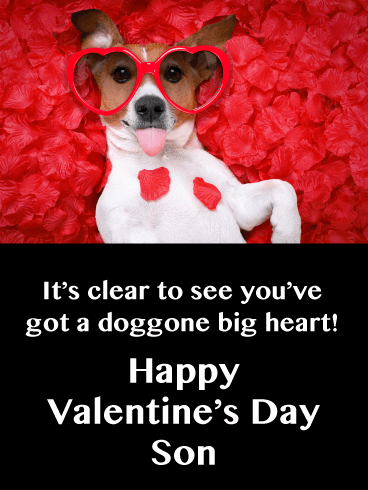 The adorable doggie on this funny card is here to help wish your awesome son a happy Valentine’s Day! Laying in a bed of roses, and wearing a pair of heart-shaped sunglasses, he makes it plain to see: your son is the sweetest person around, especially in your eyes! 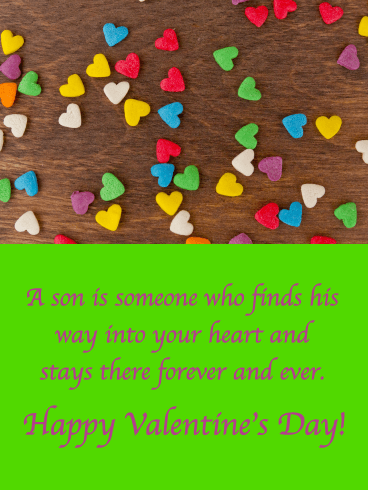 A flurry of hearts against a blue background adds a wonderful touch to this Valentine’s Day card for a special son. It’s an opportunity to let him know how much he melts your heart…something he ’s done from the very beginning. Whether you’re there with him or miles away, he’s sure to be touched by this incredibly sweet card. This charming card full of colorful little hearts against a rustic wooden background is the perfect Valentine’s greeting to surprise your son. He’s already found his way into your heart, and it’s where he’ll stay forever and ever. No matter how old he gets, your words will remind him how much he means to you. A son will steal his mom’s heart from the very beginning. 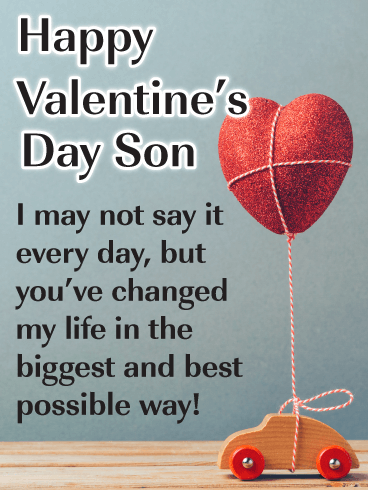 That’s the sweet message in this Valentine’s Day card to your little boy, no matter how old he may be. A decorative red heart is held in small hands, with bigger hands holding them. It’s a sentimental way to let him know how much you love him and that you’ll always be there. 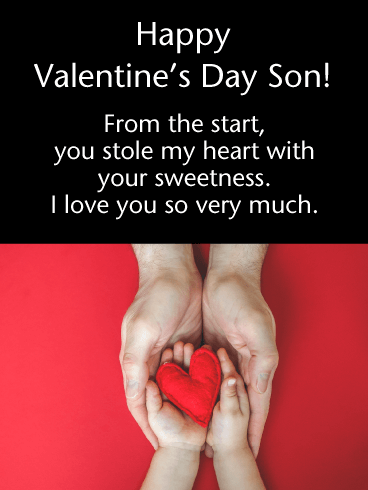 This funny Valentine’s Day card for your son will have him laughing…and may leave him feeling a little hungry! 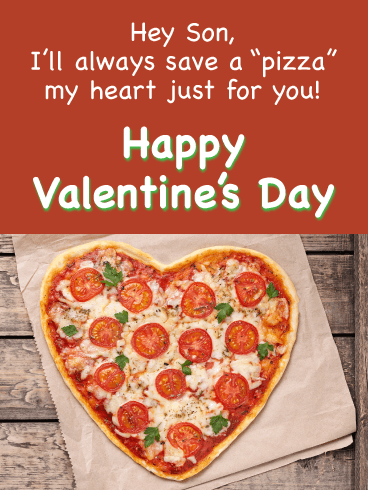 A heart-shaped pizza looks absolutely delicious, and the message adds plenty of humor while also being sentimental. No matter how you slice it, this is one greeting he’s sure to enjoy. 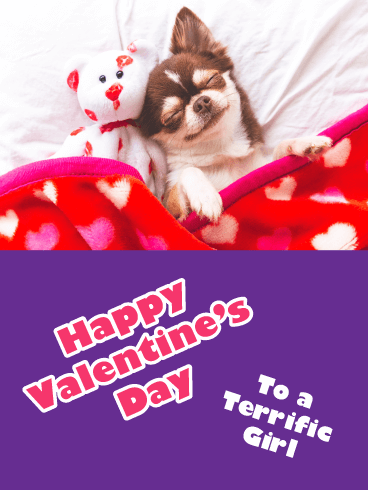 This card is so adorable that you just have to send it! 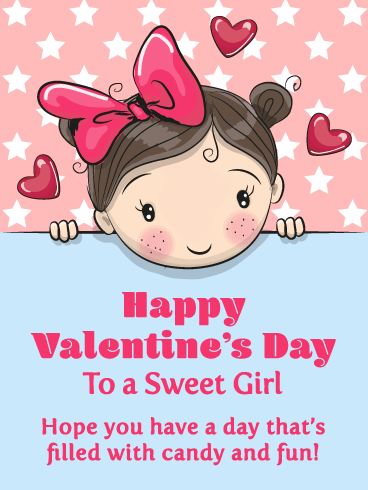 If you know a sweet little girl that you would like to make smile, then this is the Valentine’s day card to send. It features a cute girl wearing a pink bow in her hair. She is surrounded by stars and hearts, and it looks fantastic! 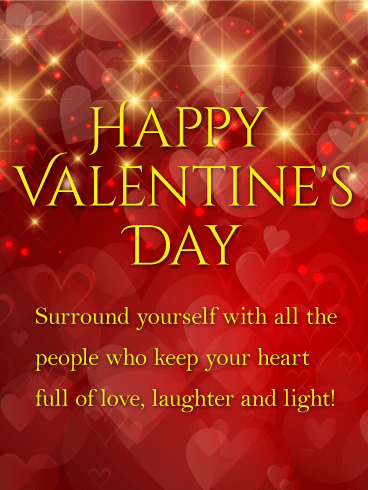 Make sure to wish the special child in your life a Happy Valentine’s Day filled with candy and fun! Your son has left an impression on your heart. And Valentine’s Day is the perfect time to tell him what an impact he’s made on your life. A wooden car is wrapped in string carrying a heart above. It’s a reminder that no matter how far he may go, he’s never distant in your thoughts and wishes. 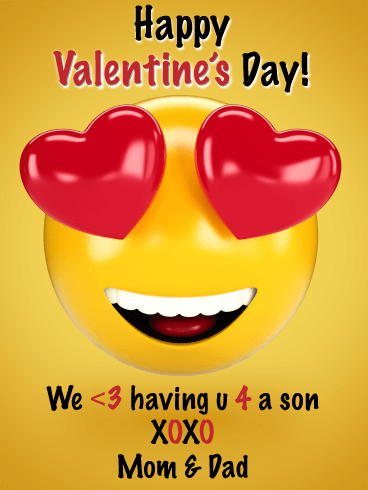 If your son is an emoji fan, he’ll definitely appreciate this playful Valentine’s Day card, which lets him know (in text speak of course), that you love having him for a son! Whether he’s still young or young at heart, this sweet greeting will get the message out loud and clear! 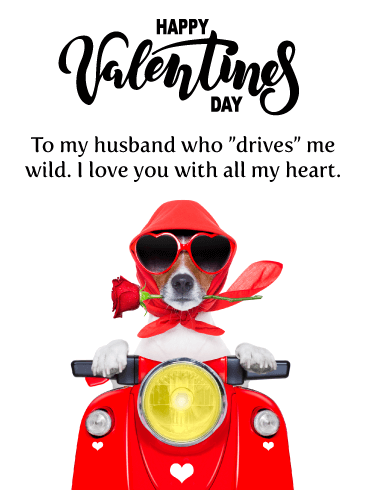 This Valentine’s Day card is unBEElievably cute! The bumblebee is adorable with its sweet smile, rosy cheeks, and pretty pink wings. It’s being lifted in the air by a special heart balloon that says “To a Special Girl”, and the child who receives it is going to just love it! 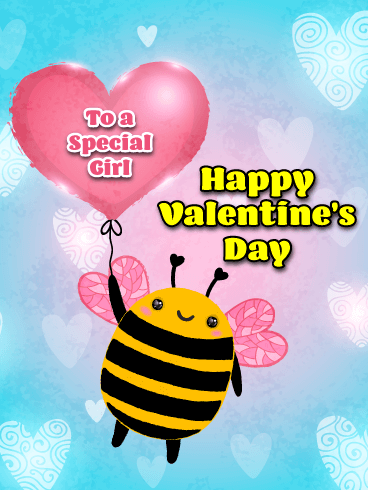 Send this little bee over to the girl you are thinking of today so she can feel special this Valentine’s Day.